Despite an impressive first game from the two-time winners of the League of Legends World Championship, ROX Tigers looked set to beat their more senior South Korean rivals in the best-of-five semifinals against SK Telecom T1. 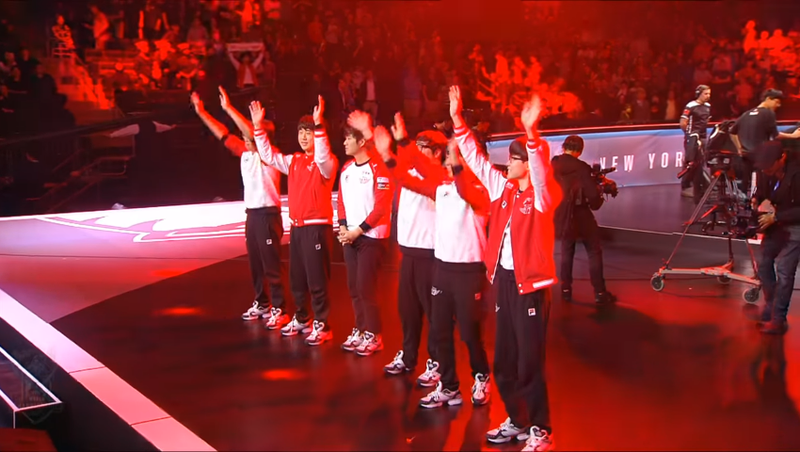 It wasn’t until game four that SKT was able to claw their way back into things and tie the series up at 2-2. And then, in the final game, SKT showed that they weren’t going to just step-aside and let the Tigers barrel on toward the Grand Finals. Things in game five didn’t start the way SKT necessarily wanted them too. Good instincts on the part of Tigers’ Wang-ho “Peanute” Han led him to first blood against SKT’s Bae “bengi” Seong-ung. But perhaps everything was on the line twelve minutes later when Tigers attempted to kill Baron and secure themselves some pushing momentum against SKT. While Song “Smeb” Kyung-ho was able to take Baron, it was SKT who were able to find their way into a team fight at the pit after first dispatching Peanut. Dropping four of Tigers’ players marked something of a turning point for the match, with the wind clearly at SKT’s back from that moment forward. Partially their success in the later half of the game came from clutch plays by players like bengi, but it also seemed to have something to do with SKT’s more refined and experience thinking across the rest of the map. The Tigers were simply outplayed and unable to pick successful encounters or find their way back into the mix by securing other objectives around the map. With Lee “Faker” Sang-hyeok and bengi on either side of him, Lee “Duke” Ho-Seong had simply grown too powerful for Smeb and company to contend with him by the late game.